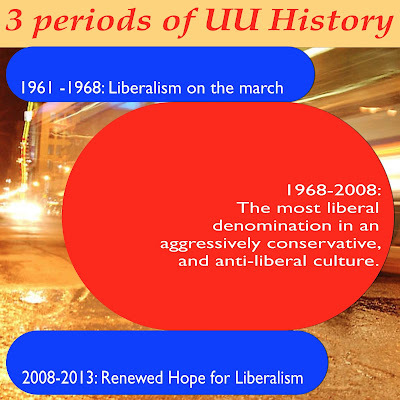 It's an undeniable fact that political conservatives are frequently uncomfortable in UU churches and congregations. They feel their minority status. People express liberal and radical views with complete assurance. Conservatives feel marginalized and even mocked. I know that this is true because they have told me. They say things like "UU's welcome everyone except Republicans." 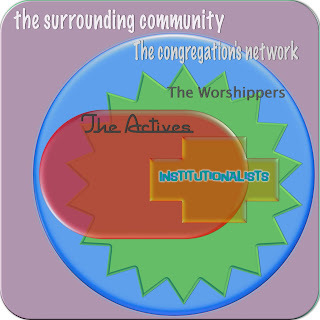 The misconception is that this situation reveals something wrong about Unitarian Universalism. We are failing to meet our aspirations. We should be a community where all political views are made comfortable, and we are not. The bottom line: the UUA Board, led by Gini Courter, and the Administration, led by Rev. Peter Morales, have reached a point of such impasse over reporting and accountability that they have seen fit to budget $100,000 for a consultant to work out their relationship. 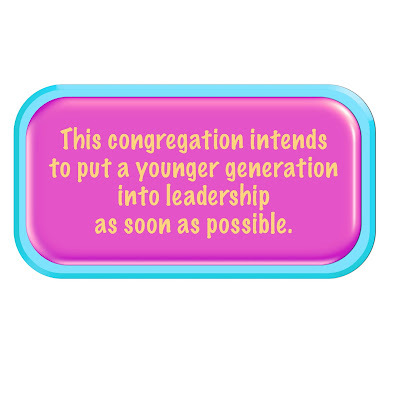 I say that there has been a catastrophic failure of the collective leadership of the UUA, and we the rank and file, lay and ordained, ought to be thoroughly and righteously angry about it. In high dudgeon, in fact. 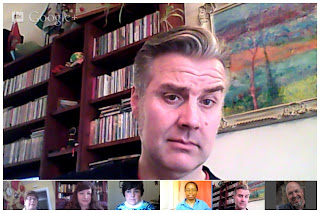 I just watched the CLF's Google+ hangout to meet the candidates for UU Moderator. The race is between Tamara Payne-Alex and Jim Key. I have spent time with both of them and both are impressive people. I don't think that we can lose. I'm not making an endorsement at this time. You should watch the video, or attend one of their many forums. I noticed something in their discussion that I have noticed before. I think that it has relevance beyond the Moderator election, Watch for it in your church and congregation or any organization that you are in. I call it Baby Boomer Perfecting Energy. I made the following observation on Facebook. People ask what I mean by "spiritual liberals" in my previous posts. Just what you would think -- people possessed by and possessing a liberal spirit. People who are living their lives oriented around values of compassion, of justice. People who move toward other people's pain and not away from it. People who tend toward openness to others, to difference, to new things coming into their lives. People who are reverent and grateful and hopeful. I think that this nation is undergoing a great awakening of the liberal spirit. When something horrible and tragic happens, like bombs at the finish line of the Boston Marathon, I go to a very calm, even distant and repressed place emotionally. I am good in a crisis, but cold. I do have a catch in the throat that comes and goes randomly. Like Roger on Mad Men, my grief comes out at odd times, as for him when he burst into tears over the death of the man who shined his shoes, after keeping it together through his mother's funeral. I almost lost it today when reading a stupid Buzzfeed posting about 29 things to love about Boston; it was a picture of the ducklings with little red scarves tied on them on a snowy day. I become very observant of what others say and think. You may have seen this on Facebook. It is an incomplete picture. This machine allows anyone to work for minimum wage for as long as they like. Turning the crank on the side releases one penny every 4.97 seconds, for a total of $7.25 per hour. This corresponds to minimum wage for a person in New York. This piece is brilliant on multiple levels, particularly as social commentary. Without a doubt, most people who started operating the machine for fun would quickly grow disheartened and stop when realizing just how little they’re earning by turning this mindless crank. A person would then conceivably realize that this is what nearly two million people in the United States do every day…at much harder jobs than turning a crank. This turns the piece into a simple, yet effective argument for raising the minimum wage. Peacebang and Shane Montoya talk about the economy and ministry. PB identifies a dilemma between talking about simpler and more cooperative living on the one hand vs just helping people accommodate themselves to lower economic standards of living. Nothing changes itself without intending to do so. Otherwise, it is changed by outside events. More likely, it doesn't change even though it should. It just gets obsolete and dies. Churches and congregations too. Without making a statement of intention, a church or congregation will not change. Stating that it intends to grow is not the same thing. What does it intend to change in order to grow is the question that must be answered. Our discussion on the debut of the VUU (the CLF sponsored gabfest and hangout) this morning turned for a while to the question of salvation. Like what do UU's mean by salvation? Why can't we use that word? (Keith Kron reminded us that one reason may be that it freaks a lot of UU's out). If you're going to talk about salvation, you need to think through your soteriology: by what and from what are we saved? Or more broadly, from what unsatisfactory state of being to what more satisfactory state of being does the spiritual move us? It is my opinion (and the comment section below is for your opinion) that UU's operate along a "virtue-based" system for moral theology. A Veteran’s Day Confession for America November 11, 2012 On this Veteran’s Day Let us confess our sins before God and neighbor. Most Merciful God we confess that we have sinned against you in thought, word, and deed by what we have done, and what we have left undone. We have become people of the lie out to tame the frontier wilderness while the beast within lurks hidden in shadow paralyzing us in a perpetual state of denial. We have made war entertainment enjoying box seats in the carnival of death consuming violence, turning tragedy into games raising our children to kill without remorse. We have morally disengaged outsourcing our killing to the one percent forgetting they follow our orders the blood they shed is on our hands too. In the 1970's, the social issues (which are really just cultural resentments moralized) coopted the conservative Protestants and the Roman Catholics for right-wing politics. Faced with an aggressive and ascendent conservatism in the 70's and 80's, Liberal Religion separated the personal and pastoral from the public and prophetic. To bear witness to public liberalism got to be too hard, too frustrating, too dispiriting. The progressive movement was caught up in internal conflicts between liberals and radicals. In a silent refutation of the understanding that "the personal was political", the liberal church accepted a compartmentalization of the human being into individual and social spheres. Margaret Thatcher is dead. Some people are quite loyal to her and to her memory. Being a follower of Margaret Thatcher was an important decision in their lives, and they remain loyal to her and to that earlier version of themselves that supported her. On the other hand, a lot of people recognize that Thatcher-Reagan Thermidor against the possibilities of liberalism as a tragic mistake, one that had profoundly negative effects on millions of people's lives. A little kerfuffle has broken out about how to remember someone like Margaret Thatcher. The little subservient loyal subject in all of us wants to offer tribute to the great and powerful who made the world that we live in. Others keep pointing out the obvious and unmistakable historical truths of her life and work. It is time to declare the Thatcher-Reagan experiment over. It was a failure. It didn't create a better society. In fact, what has emerged at the end of this forty years of history is an obscene maldistribution of wealth, a new aristocracy, and a general decline in the lot of the poor, the working poor and the middle class. Our new aristocracy is the nobles of the financial sector, who control the movement of capital in the economy, and take a little bit on everything, despite adding little in value. The other beneficiaries of the last forty years has been the fossil fuels industry which plans to take the whole planet down with them as the approach the end of the resource that they have been exploiting all along. Morally decent people everywhere see the individual pieces of this social policy disaster, but are only now connecting all the dots. The Human Rights Campaign is, to use the language of the Left, a Right Opportunist organization. It can be successful because it asks for so little. Its demands are the demands of the people closest to the system. Marriage Equality is not a particularly radical demand; it's actually a conservative demand. 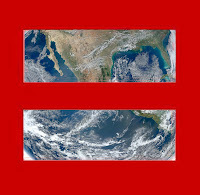 A lot of people are angry at the Human Rights Campaign, especially after it inspired 2-3 million people to change their facebook profile picture to a red equal sign. Those angry folks are Left Sectarians, again, in the language of the Left. They are angry and frustrated at the Right Opportunists leadership of the movement, and angry that the less involved (the masses seem to prefer the wrong leaders. Aside from going to the Easter service at the UU congregation of Ann Arbor, which was not especially Christocentric, I didn't do anything particular for Holy Week. Yes, I posted some blogposts from the privacy of my study, and in the dead of the night, but I didn't go to any of local church services. There is a very nice small, progressive Methodist church around the corner, complete with rainbow flags and folk singers. They had a Good Friday service -- short, 30 minutes and repeated three times. They had a service and a potluck on Saturday afternoon. I didn't go. I didn't expect this response to Holy Week, now that I am out of active parish ministry. 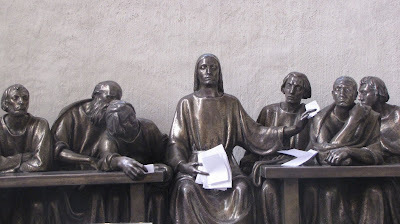 Mostly, what I feel is relief; I allowed myself to be aware of the frustrations and resentments I had felt in active parish work during this season.